Enjoy the comfort of an open floor plan, vaulted ceilings & large stone fireplace in this well furnished 2000 square foot townhouse. The townhouse is an end unit offering an abundance of natural light & adjacent to open space. 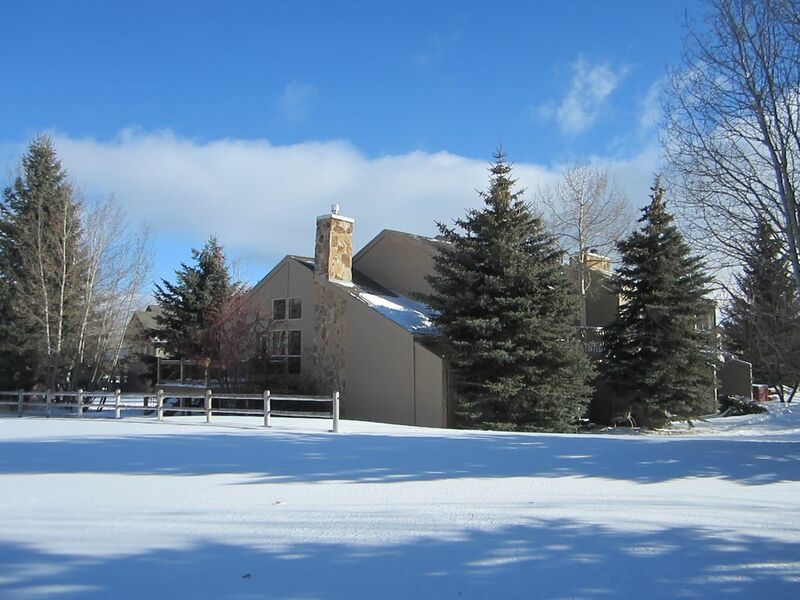 Newer windows throughout provide wonderful mountain views of the Canyons & Park City Ski Resorts. Relax & enjoy the view from the deck conveniently located off of the kitchen/dining area. The deck features a table with 6 chairs and a gas BBQ. There is also a deck off of the master bedroom with a table and chairs. The patio behind the townhouse has a table and chairs. The living room has a large chenille sectional with over sized ottoman. For entertainment there is a Sony flat screen t.v. & Sony home theater system with Blu-ray disc player. The newly remodeled kitchen features stainless appliances and granite counters. The dining table seats 6 and the island seats 2. There are tile floors in the kitchen/dining area. A high chair & booster seat is available upon request. Each bedroom features a King size bed with both a down & silk comforter along with high quality cotton linens. Each bedroom has cable t.v. The master bedroom and main floor bedrooms have Panasonic flat screen t.v.'s. There is also a queen size futon & queen Murphy bed. A crib is available upon request. The large master tile shower with 'Euro-glass' enclosure. A full bath with tub/shower and 3/4 bath with tiled shower are located on the main floor. All bathrooms have granite counters. After a long day of skiing or recreation, relax in the private deluxe Bullfrog spa. It features seating for 6 with lots of jets & colorful LED lighting. There is a single car garage, 2 car driveway & additional guest parking only a few steps away. The townhouse is conveniently located within a short walking distance of the 'free' Park City shuttle bus providing transportation to the ski resorts, markets & shopping. Full size washer / detergent supplied. Full size gas dryer / softener sheets supplied. One car garage. Garage door opener provided. Ample amount of cotton towels provided. New stainless dishwasher, detergent provided. New stainless refrigerator with icemaker. Fully equipped with dishes, cookware & appliances. Spices, paper towels & paper napkins provided. Comcast expanded cable. Sony HD flat screen t.v. with 5.1 home theater, Blu-ray disc located in living room. All bedrooms have a t.v. Master & main floor bedrooms feature a Panasonic flat screen t.v. List of 200+ DVD's to select from. (2) 1 deck located off of master bedroom, 1 deck located off of kitchen, 1 patio located behind townhouse. Tennis court located 1 block away from townhouse. Several golf courses to select from in and around Park City. The closest is located 1 mile away from townhouse. Private BullFrog brand hot tub, comfortable seating for 6. 'Free' Park City shuttle bus, short walk from condo. We had a great stay here and Suzy was very accommodating and helpful. We will be staying here again when we return! Excellent facility, location & host. Very clean & well-equipped. Would stay here again. Everything was perfect for our needs. This home was so cozy and a great location. The kitchen was the best stocked kitchen of any rental I've ever used. The house was very clean. Hot tub was great. Sheets were super soft. Beautiful view. We came home to a young moose under our deck one day, it was amazing! nice quiet neighborhood and kitchen was huge and had everything you needed for preparing meals. she provided us with a nice clean crib and high chair for our 6 month old granddaughter. if your looking for a nice quiet place for families, would highly recommend this place. The place was perfect for our family - well stocked with everything we needed. Suzy was an incredible host - very gracious and responsive. I would stay there again in a heartbeat and strongly recommend it to anyone. A 2 night deposit required to reserve. No cleaning fee. Spring/Summer/Fall monthly rental rate includes utilities, cable, Wi-Fi & spa. Spring/Summer/Fall 3 night min. rental. Ski season 3 night min. rental. Winter holiday 6 night min. rental.